Define the height of the bricks and the wall, and draw the vanishing lines. If you want to avoid having construction lines on your drawing, construct your wall on a piece of sketch paper first. Then use it as a guide directly from the grid stage or draw the brick outlines and then trace it onto your final drawing. 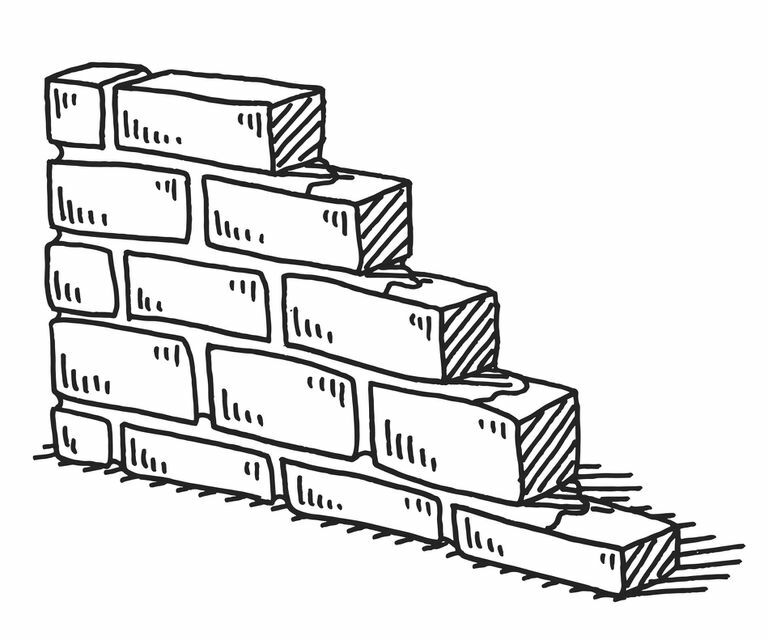 Before you start drawing, decide how many bricks high your wall is and how many high the bricks should be. Draw the front vertical edge of your wall, measuring out the height you want, and then draw the vanishing lines back to the vanishing point. Mark out the height of the bricks on the wall, and draw those vanishing lines too. Remember, these are your 'working lines' so make them light and precise. An easy way to do evenly divide the wall is to use the crossed diagonals method of dividing a rectangle in perspective. This looks pretty untidy — it's one of those 'quick and dirty' methods that work, even if it isn't pretty! Getting geometrically correct measurements is a laborious process — for this, we'll go with what looks right. Using the crossed diagonals, find the center of the wall, then do the same for the half each side, and so on. Keep dividing the wall until you have it divided roughly into squares. Create a simple linear brick pattern. At this point of the drawing, you can go for the simple linear option — drawing over the horizontals and adding vertical lines on alternating divisions to create a basic brick pattern. These are drawn freehand so that looks a little less mechanical, but it does tend to look a bit stark. Next, we'll look at some other ways to draw the bricks. Crisply drawn bricks and mortar in perspective. H South, licensed to About.com, Inc. Here is the completed bricks-and-mortar wall in perspective, with erased your working lines. It looks very 'basic' at this stage, especially since I've drawn quite heavily so it would scan well. To create a properly finished drawing, I'd normally draw the construction so it was barely visible, giving a much cleaner finish — or alternatively, work in a much looser and sketchy fashion to give the drawing more energy. That is my preferred way of working. To add interest, you might add hatching, or if you've drawn it in pencil, lift some graphite with an eraser and add some texture, breaking up lines and adding patches of detail and damage. Pencil shading and hatching can be used in a controlled or relaxed fashion to create an effective brick texture. In this example, I used the drawn wall grid as a guide, placed under the drawing paper, and sketched in the bricks. I allowed the tonal values and direction to vary to create the effect of varied brick color and tone. If you enjoy the patterns and textures of brick, you might like to check out the beautiful architecture of the Mark Twain House. It'd be a wonderful sketching subject! An informal brick wall sketch. H South, licensed to About.com, Inc.
Another brick wall in perspective — Here's a simple cartoon or informal version. Use the same basic linear approach we previously looked at, but with a less precise line, leaving some blanks and adding some rough hatching to suggest a varied brick texture. Stippling works well at both large and small scales. These examples are drawn with a felt-tipped fine point marker giving an irregular mark. Use a metal-tipped drafting pen for a more precise mark. 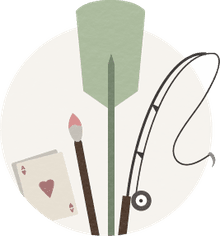 With stippled textures, you are creating the illusion of tone or shading by making lots of dots, like an old-fashioned newspaper print, with many close dots giving a dark tone, and scattered dots giving a lighter tone. You can check the look by taking a step back and viewing your drawing at a slight distance. The key to good stipple texture is to take your time. Generally, a random pattern is best, so move your hand around in a fairly random way, returning to the same area to build the groups of close dots for darker tones. Keeping the pen vertical gives you a nice round dot. Trying to do 'lines' of dots and using a slanted pen can result in a directional look, with visible banding making your surface seem to have ridges along it.